Fabric: 100% High Visibility Polyester, High Durability, Washable, 8 Stitches Per Inch (Seams & Pockets), Light Weight. Pockets: Two lower front solid patch pockets with flaps, Left chest radio pocket, Right chest 2-tier pocket, Two large Ipad lower inside pockets. 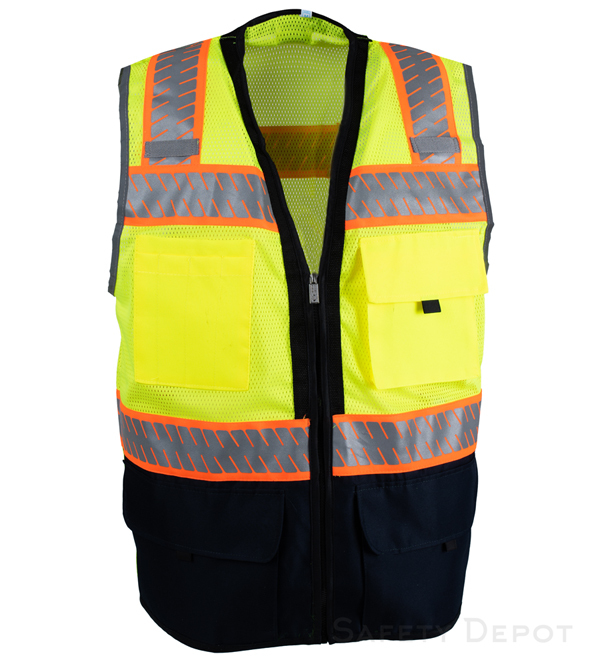 Lightweight, two tone, comfortable fit, high quality safety vest with unique reflective tape. Durable Black bottom allow for messier jobs without the safety vest getting dirty. Reflective tape has a enhances the visibility of the wearer in nighttime or low-light conditions when illuminated by headlights. They are sewn in and runs horizontal, vertical, front to back. A total of four convenient and spacious pockets lie in the chest and lower abdomen area. There are also two large inner pockets on both sides, made for Ipad mobility. Generous arm cut for greater mobility. Washable up to 25 times. From Anonymous of g, Philippines on 8/3/2018 .